We want to update you on the Pine Sawfly situation as we know it to date and share what you can do yet this fall. We also want to give folks another opportunity to send emails to the Provincial government regarding the Wiky situation to the north, The deadline is October 16th and we’ve learned that some of you wanted to email but the document provided in the last eBlast didn’t work for you. So if you have not emailed your concerns as of yet and would like to, please find below a reprint of the September eBlast explanation and the NEW link to a workable word document with suggested wording for your use should you wish to add your own comments. Happy Thanksgiving to all our Canadian Members! The good news is that a sudden storm with fierce winds, followed by a stretch of cold nights, has reportedly ended the feeding of the pine sawfly larvae for this year. Those heading for their cottages for the Canadian Thanksgiving weekend will be pleased. PaBIA’s Environment Committee extends special thanks to all those who responded to our request for information on the infestation on their property, including location and degree of severity. The over 110 responses provided sufficient data to prepare a map ONLY for the purpose of showing the extent and possible concentrations of the outbreak this fall. Assessing the information received, the Township of the Archipelago Council arranged for environmentalist David Bywater (GBBR) and veteran forester Ken Webb (Westwind) to tour the Pointe au Baril Islands on September 28th for the purpose of assessing the severity of infestation and recommend management options. Accompanied by Shelagh Grant, PaBIA’s Chair of Forest Health and provided with the map, they made an extensive survey by water and landed at two sites reporting severe damage to verify the cause and other contributing factors, as a basis for recommendations of appropriate measures to protect our pines. The map proved extremely helpful – our sincere thanks to those who so willingly provided the information necessary to chart approximate locations of both light and extreme infestations. As might be expected, many severely damaged trees were also infected with the Pine Shoot Beetle and/or were surrounded by very little topsoil, hence particularly vulnerable to the drought conditions occurring last August and September. Similarly, small rocky islands with a few pines seemed harder hit, but overall visible damage was very inconsistent. Perhaps noteworthy was lesser damage noted on those properties, who reported having hosed down the larvae from the pines, once – sometimes twice last year. Some properties showed no signs of apparent damage. As a result of their findings, David Bywater and Ken Webb will be preparing a report for the Township Council’s consideration at their October meeting later this month. Until PaBIA receives a copy, there isn’t anything definitive to report. suggested that IF we were at the cottage this coming weekend and see closed, hard, brown pupae cases on patios and decks, we should sweep them up and destroy them, as these will weather the cold winter under the snow, allowing the adult sawfly to emerge in the spring and fly to healthy pine branches to lay up to 70 eggs in slits along the needles’ edges to produce a new generation of larvae next June. and burn. 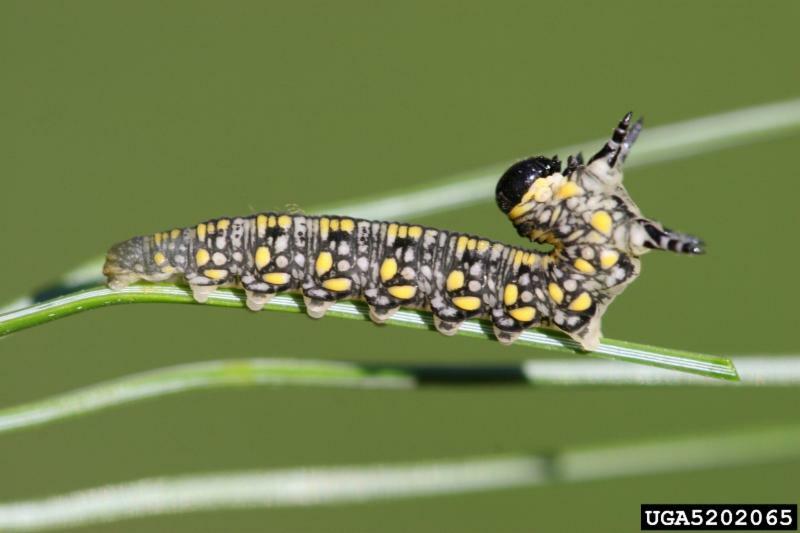 Keep in mind that one larvae equals one pupa case equals one sawfly equals 70 eggs and potential of 70 new larvae. The fewer larvae next June, means less risk of severe infestation next fall. Otherwise, any further action should wait until the spring. to send it off TODAY! Are you familiar with the issue that the GBA has been following regarding a proposed settlement of Canadian Crown land to the Wiikwemkoong First Native nation? Essentially, one of the prime paddling destinations between Killarney and the French River is being threatened by a proposed land settlement by the Ontario Government to the Wiikwemkoong First Nation. Philip Edward Island, and most of the smaller islands surrounding it, are being offered by the Ontario Government to the Wiikwemkoong First Nation, as part of a land claim settlement. These lands were never claimed by the Wiikwemkoong, but the Ontario Government is proposing to give them away rather than deal with the lands that actually were claimed. This settlement, if it proceeds, would make virtually the entire Georgian Bay coast between Killarney Provincial Park and French River Provincial Park inaccessible and off limits. Further to my previous correspondence on the Wiikwemkong (Wiky) Land Settlement, I would like your help in getting GBA members to send letters/emails to the Ontario government expressing their/our interest and concerns over the proposed settlement. We have drafted the attached sample letter for people to consider using. As you will see, we are not only focussing on the immediate proposal in the Killarney area but also the larger Wiky Land Claim on all islands from Penetang to Sault Ste Marie and the potential for this settlement to trigger other claims by other First Nations. The formal public consultation window is open until October 16th. As in all government consultations, number of responses is key. If the government does not hear from many members of the public they will assume that their proposal is acceptable. So please get the word out to your members and encourage them to send in letters immediately. Further background information can be found on our web site. Joanne Stevenson, E50 ‘Chowne Is.’, wife of the late Hugh Stevenson, mother of Bill (Elizabeth) Stevenson, September 2015.